A new report provides a useful summary of the naval nuclear dynamics in the Indian Ocean. A while back, I reported on the murky details surrounding Pakistan’s sea-based nuclear deterrent. Much of it remains a mystery, including its future submarine force. 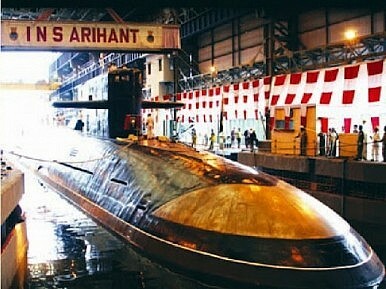 Conversely, the Indian Navy still does not have a capable ballistic missile with which to arm the INS Arihant — New Delhi’s only ballistic missile submarine (which only began sea trials in December). India’s submarine fleet is also experiencing difficulties in maintaining its readiness rate, which has dropped below 40 percent. However, both India and Pakistan are set to continue to develop their naval nuclear forces, as a new report by the Carnegie Endowment for International Peace points out. Yet, this should not automatically be a cause for alarm, Iskander Rehman, the author of a newly released Carnegie policy paper, argues. “By further institutionalizing relations between their navies and by insisting on stronger transparency with regard to naval nuclear developments, both countries may succeed in adding a greater degree of stability to what otherwise promises to be a dangerously volatile maritime environment,” he notes. India’s pursuit of a sea-based nuclear strike force is the next logical step in its quest for an assured retaliatory capability. To enjoy an effective sea-based deterrent vis-à-vis China, India’s other prospective nuclear adversary, New Delhi has to develop larger SSBNs with greater missile carriage capacity and more powerful nuclear reactors. Pakistan’s naval nuclear ambitions are fueled primarily by the sense of a growing conventional, rather than strategic, imbalance between New Delhi and Islamabad. By dispersing low-yield nuclear weapons across a variety of naval platforms, Islamabad aims to acquire escalation dominance and greater strategic depth and to reduce the incentives for a preemptive strike on its nuclear assets. Writing for The Diplomat, Amit R. Saksena, already elaborated on this point back in January. “For a sea-based asset, where deterrence is primarily achieved by long-term radio silence, and launching control is delegated to seniority on board the vessel, the existing command and control model is not applicable,” Saksena emphasized. India’s nuclear warfare policy is predicated on a No First-Use (NFU) doctrine; consequently, New Delhi needs to field a credible second-strike capability. “Just like Pakistan’s tactical nuclear weapons (TnWs), New Delhi will essentially be delegating launch control to field officers on board the submarine, massively increasing the probability of incidental firing,” according to Saksena. Rehman does not discuss this issue in any detail. Nor, despite highlighting the problem, does he elaborate on what a new command and control model for India’s strategic forces might look like. However, the report contains an interesting section on what lessons Islamabad and New Delhi can derive from naval nuclear operations during the Cold War, as well China’s future role in shaping naval nuclear policies in the Indian Ocean. At the end of the report, which is worthwhile reading in its entirety, Rehman concludes that “the present period offers a precious window of opportunity for both New Delhi and Islamabad to shape, rather than be shaped, by the emerging naval nuclear regime in South Asia.” Yet the window for the implementation of new confidence-building measures between the two countries is shrinking rapidly.